North Bar spreads its tentacles a little further out from its Leeds heartland! Spread across two floors, North Bar Social will boast the same commitment to providing the very best beers in the world in a cosy and unpretentious atmosphere. At the Crown, we are dedicated to the quality of our beers, lagers and ciders. We are dog and family friendly. The bare boarded floors and exposed brickwork help make this rustic hostelry a most welcoming place to meet. 20 Main Street, Esholt, Shipley, Bradford BD17 7QZ. Tel:01274 809495. This is the pub where the TV soap Emmerdale was previously filmed. 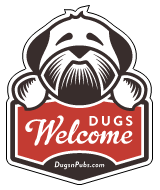 There are a total of 98 dog friendly listings in the Yorkshire Pubs category. Please log in, or sign up as a member to view all listings.